/ Which Is The Best PMP Boot Camp Online Training Course of 2019? You might be looking for the best PMP boot camp class. 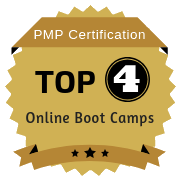 I have written this article to review and compare the PMP boot camp online training programs. These programs offer instructor-led live online classes for PMP certification. They are also called PMP live online, live virtual, instructor-led online, or simply virtual classroom programs. They can be used to satisfy the mandatory requirement of 35 contacts hours of project management education for attaining the PMP credential. You will find a comprehensive review of top PMP online boot camp courses in this article. It includes comparison, ratings, rankings and my final recommendation. A PMP boot camp provides the best learning and the certification exam preparation environment. It teaches you PMP concepts in a short, intense, and rigorous training course. You earn 35 contact hours in a short span of time without any distractions. It is akin to a military training camp, with very harsh discipline. But everyone can’t attend a classroom program. A PMP boot camp happens infrequently in designated cities. It is usually expensive and provides very little post training support. A PMP boot camp online training course is as good as a physical classroom. It is similar to a regular boot camp as as it follows a definite schedule and is taught by an instructor. But instead of a physical classroom, the instructor teaches live over the Internet. You attend a series of virtual online lectures to complete the course. You also get additional study material like videos, audios, presentations, practice tests, and workbooks. Does The Provider Issue Mandatory 35 Hours Certificate? How Good Are The Trainer’s Credentials? What Is The Total Duration Of The Class? What Study Aids Are Provided As Part OF The Program? Knowledge Area Study Guide Yes No Yes. Andy Crowe’s book. Yes. Rita Mulcahy’s book. Knowledge Area Questions About 300 300 1200 through Andy’s book& Insite About 500. Part of Rita Mulcahy’s book. PMP Tips & Tricks Yes. Part of eLearning videos. Yes. As part of the course and through weekly newsletters. Yes. Part of Andy Crowe’s book and Quick Reference Guide. Yes. Part of Rita Mulcahy’s book. Does The Provider Give Access To eLearning Videos? eLearning Content Included? Yes Yes Yes No. Available separately at USD 988. Study Assistance Yes. Through phone & email with the Instructor. Yes. Through coaching & forums. Yes. Through Velociteach training team. Yes. Through RMCL training team. Interaction with Instructor? Yes. During the class and through phone & email. One-on-one special sessions on phone. Yes. One-on-one through personal coaching. Yes. During the class and through phone & email. Yes. Only during the class. Application Assistance? Yes. From Instructors. Yes. Through forums. Yes. Through email and phone. Yes. Through email. USD 250 – within 14 days prior to the class. USD 500 – after the class starts. Yes. Available before the class starts. Refund Policy 100% refund – 7 days before the class starts. USD 150 cancellation fee – within 7 days of the class start. 75% refund – 24 hours after the class starts. 100% refund within 90 days. With charges. Course Fee minus USD 628 – 30 days before the class starts. With cancellation charges. USD 50 – 30 days prior to the class. USD 150 – between 30 days & 8 days prior to the class. No refund – within 7 days of the class. PM PrepCast is not a traditional instructor-led course. The main course comes in the form of eLearning videos and other exam prep material for your self-study. In addition to the self-study, you can schedule 12 hours of individual and 5 hours of group coaching sessions with an instructor. PM PrepCast is available in three variants – Basic, Elite & Executive. PM PrepCast Executive is a combo product – it includes PM PrepCast Elite and many other exam prep products as detailed in the table above. PM PrepCast Elite is also a combo product that includes PM PrepCast Basic and PM Exam Simulator. PM PrepCast Basic is a regular online self-learning course. Velociteach’s program is targeted towards North American residents. It is one of the most expensive programs but it is available at an exclusive discount of USD 100 on this blog. Velociteach also holds regular boot camps. You can avail USD 100 discount for these classes also. You can click on the Velociteach’s links to know their current schedule. RMC’s program is equivalent to 18 hours of project management education. RMC does not provide 35 contact hours certificate. Trainer’s Credentials – All providers prominently display Trainer’s bio on their website. All the instructors are experienced and knowledgeable. I have given 5 star rating to all the providers. Class Duration – Ideally the instruction time should be about 35 hours. I have given 4 star rating if the instruction time is between 24 to 28 hours. Otherwise, I have given a 3 star rating. Study Aids – I have given the rating based on the quantum and utility of study material given by the providers. eLearning Rating – I have given the rating based on the amount of study material, instructional videos, and access duration. I have given 0 stars if there is no eLearning access. Offline Support – I have given the rating based on the quantum and type of support given by the providers. Content Quality – I have given the rating based on the review of online study material given by the providers. I have not considered pricing, refund policy, and pass guarantee, while arriving at the ratings. I believe training programs should be compared on the technical factors like quality & content – pricing should not influence the rating. However, since everyone has a different budget, you should consider the price before taking the final decision. The PMP Exam preparation is an expensive affair. The training cost is one of the major expenses. You should choose your training course carefully. The quality of complete training package should be good and it should provide a good value for your money. RMC is an established brands in the project management training industry. Its offerings is popular but it has not fared well in our comparison. Some aspects of RMC’s program is very good, but its overall rating is low. Moreover, RMCLS ourse does not even provide 35 contact hours certificate. A 35 contact hours training is mandatory to take the PMP exam. I would not recommend you to buy RMC course. After doing a thorough research, review and evaluation, here is my final recommendation. Christopher Scordo is the founder of PMTraining. He is a well known personality in the Project Management training industry. His book (PMP Exam Prep: Questions Answers & Explanations by Christopher Scordo) is one of the best selling books for the exam prep. PMTraining’s course is a traditional virtual classroom course. It provides very good schedule flexibility. It is the most reasonably priced course in our comparison. Its rating is little bit lower than our first choice. Overall PMtraining program is excellent. You can invest in it without any fear. PM PrepCast is not a traditional instructor-led course, but it excels on all accounts. The main course comes in the form of eLearning videos and other prep material that can be used for the self-study. In addition to self-study, you can participate in 12 hours of individual and 5 hours of group coaching sessions with an instructor. The package is reasonably priced and provides downloadable access to all the videos. Even though PM PrepCast Executive is a non-traditional course, you can invest in it without any fear. But, if you are not comfortable with the non-traditional approach of this course, then you should opt for my other recommendations. Velociteach’s program has many benefits. For last many years, Velociteach has been named as PMI’s Education Provider of the year. But it is not the highest rated course in our comparative review. It does not provide schedule flexibility, which I think is a must for a live online course. It is available at an exclusive discount of $100 on this blog. You can avail this discount by clicking on the button below and using the promo code ‘PMbyPM100’ at the time of checkout. This coupon code works for both Velociteach’s regular classroom program and instructor led online program. This program should suit you if you are looking for a brand name and are not worried about few extra dollars. Specially if your company is sponsoring a PMP course, then you should definitely enroll into this program. But if you feel that it is a bit expensive, then you can look at my other recommendations. I believe, one of my recommendations would suit your needs. You can buy any one of the recommended courses mentioned above. However, if you want to explore more courses, you can use the key parameters (described in the Appendix below) to review, evaluate and compare any other course(s) that is not covered in this article. What are the key factors or attributes that makes a PMP live online training good? What are the things that you should look out for before enrolling in such a course? Here is a list of key parameters that are must for an PMP live online training. Registered Education Provider (REP) – This is not an essential feature of a online PMP course, as a non-REP can also also issue a 35 contact hours certificate. However, a REP status gives more credibility to the provider. Moreover, the certificates issued by a REP are pre-approved by PMI. I believe you should invest in a training from REP only since you would be spending a huge amount to get training for an extremely difficult exam. 35 Hours Certificate – 35 contact hours of project management education is mandatory to appear for the credential exam. In my opinion, there is no point is pending so much money if the provider does not issue a 35 contact hours certificate. Trainer’s Credentials – In my opinion, this is the most important aspect of an online boot camp. A trainer is your guide, your mentor and the coach. Most of your learning is going to happen in the virtual classroom. The trainer must have good knowledge and experience. He should enjoy good reputation and credibility in the industry. In addition, it helps to have a trainer whose native language is English. If you feel that the trainer is not good enough, then you should disregard the training provider. Class Duration – Traditionally, the boot camps used to run for 5 days. But due to cost and time constraints, they have now shrunk to 4 days. In my experience, as a PMP trainer, 5 days or 35 hours of instruction is ideal for the exam prep. In today’s scenario anything more than 24 hours of instruction is good. Study Aids – An online boot camp should provide additional study material besides the class instruction. The class instruction is good for understanding the concepts, but actual exam prep happens after the class. The provider should give you things like video & audio content, practice tests, downloadable workbooks, formula guide, glossary etc. eLearning Access – I believe access to eLearning content is extremely important for the exam prep. You can listen to the audios and watch videos while you are doing mundane jobs like jogging, commuting, waiting at Doctor’s, transiting through airport etc. You can potentially save 25% of your preparation time by using eLearning videos. Offline Support – Many courses provide study & administrative support through emails, private forum discussions, and webinars; while some others do not provide this feature. This is an important feature and your course should provide this feature. Your training provider should give some sort of offline study assistance. Most of your study will happen after the class. Study assistance is an extremely useful feature for extra motivation & clarification of doubts. You might feel lost in the absence of such a feature. Content Quality – The quality of content is another important aspect of a PMP online training course. You would have to study & understand things on your own. You will face problems, if the content quality is not top-notch. The written content, pictures, graphics and illustrations should be clear & readable (in presentations & videos). The speech quality should be excellent in both video & audio content – the instruction should be clear, well-paced, and without any discernible accent. Overall, the content should be engaging & interesting. Schedule Flexibility – This feature may or may not be good for you. If you are need extra motivation and self-discipline then this feature could be a bane. You will be focused & diligent if you have to follow a strict study schedule. On the other hand, you can manage your time better if you have a some flexibility with the schedule e.g. short duration classes classes in evenings or on weekends etc. Class Transfer – You may need this feature during some exceptional circumstances. Most providers have some flexibility if you give them a valid reason. Refund Policy – Just like the previous point, you may need to get refund of your money in an exceptional circumstance. Most providers have some sort of refund policy. Pass Guarantee – Some courses provide a pass guarantee. Generally, under such a guarantee, the training provider either refunds your fees or allows you to continue to access the course till you pass the exam. A pass guarantee is not a bad attribute in itself. If all the other things are equal, then pass guarantee could be an icing on the cake. Otherwise, do not get swayed by it. Do you want to enroll in a course to fail the exam? You neither want your money back nor waste time & money on additional PMP attempts. So, a better approach is to invest your time & money in a good, credible, and popular course. Disclosure: I have not received any compensation (in cash or kind) from the Authors or the Training Companies or anyone else associated with any of the training courses. But this article contains affiliate links – it means that, if you click & buy from these links then, I will receive a small commission. This commission helps me in maintaining this blog for free. However, you don’t pay anything extra. I do not actively use any of these products since I am already certified. But, I recommend only those products that I believe will definitely help the certification aspirants.